Unique luxury at your disposal. Looking For A Home Away From Home, More Space Than A Hotel, Luxurious Serviced Apartments - Carlton Court Has It All and More. Carlton Court Mayfair is proud to offer you a selection of stunning, 1, 2, & 3 bedroom serviced apartments in the heart of Mayfair, London. All our serviced apartments come with all the usual luxury refinements you would expect, such as direct lift access, reception rooms, and fully fitted bathrooms and kitchens. If you are looking for a long term lease on a luxury house, then we can offer you our amazing 5 bedroom ambassadorial townhouse situated in the centre of London. Irrespective of whether you choose our luxury serviced apartments or our stunning house; you will enjoy our inclusive services. If you are looking for accommodation in the central London area, then you can book our exclusive serviced apartments from as little as £250 per night (season & availability dependant). Latest TV’s in every room (Full Sky HD package, sports etc ) Separate International Satellite With Arabic, Indian, European Languages to name a few. With so many options in London it is important to understand what sets Carlton Court – our block of private serviced apartments in Mayfair London – apart. Found in the very heart of central London, Carlton Court is situated in the highly prestigious area known as Mayfair, which is regarded as London’s safest area, because of this you will find VIP’s, business professionals and celebrities alike, walking the streets outside our very door! All this is just a stone’s throw away from all the best locations and amenities London has to offer. Carlton Court provides the same services you would expect to find in a 5* hotel, but you enjoy much more as part of your stay. You will benefit from more space than you would find in a typical hotel room or suite. Our apartments and town house come with their own kitchens, separate bathrooms and bedrooms and enough space to cater for all your needs when visiting London. You also enjoy the benefit of having complete freedom as these apartments and our Mayfair town house afford you the privacy of a home from home, unlike staying in a large hotel. Our 7 beautiful apartments can be rented individually or as one complete block. This can also include the 5 bedroom townhouse. What’s more this 5* Mayfair accommodation costs less than you would pay for the equivalent in a hotel. In some cases you save 50% against 5* hotel day rates. What set’s Carlton Court apart from other London apart-hotels or similar serviced apartments in Mayfair is our unique inclusive services. We provide all the services you would find in a 5* hotel, but unlike other serviced apartments these are complimentary and are 7 days a week. Carlton Court provides a custom and confidential 24hr concierge service to all our residents. We have facilitated leisure activities for tourists, professional business people, dignitaries, VIP’s and royalty during their stay with Carlton Court. Should you want support in making the most of your stay in Mayfair London then our five star concierge service will help you achieve this. If you have special requirements for your stay in London then contact our Concierge Team to discuss this and we’re confident we can help. Our apartments are ideal for short or long business trips or relaxing leisure holidays with all the wonderful tourist sights of London. If you are relocating to London, between houses or just searching for the right place for a relaxing break, Carlton Court offers the best in serviced apartments. Unique exclusive serviced spacious apartments. Best central location - Mayfair. All services are 7 days a week, 24 hours a day, security concierge. Best Price Guaranteed. Simply check availability and one of our reservations team will answer immediately. 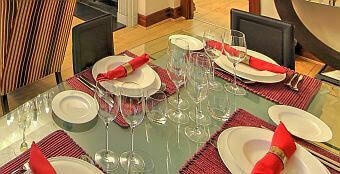 Town House - amazing 5 bedroom house available immediately.